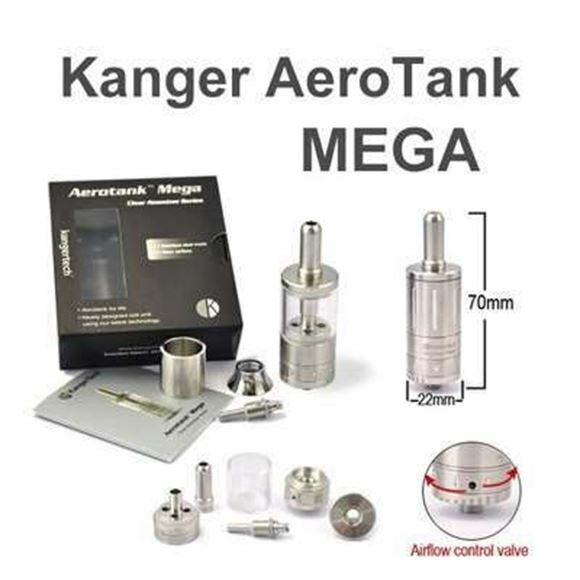 The Kanger Aerotank Mega Glassomizer offers the same great features and performance as the Kanger Aerotank Mega Glassomizer but with a redesigned airflow valve. Turn the dial on the base to increase or decrease airflow to your preference. It also comes with a stainless steel replacement tube if glass isn't your thing. In this version the atomizer heads have also been redesigned with the wicks hidden to further prevent leakage. The metal tube in the center of Kanger Aerotank Mega Glassomizer leads from the mouthpiece to the battery end. Avoid getting liquid in this tube when filling Kanger Aerotank Mega Glassomizer. When unfastening the base (atomizer head) to refill the Kanger Aerotank Mega Glassomizer, the seals are temporarily broken and liquid will leak from the mouthpiece or escape into the center tube. Always wrap a cloth or piece of tissue around the mouthpiece when unfastening the base of the Kanger Aerotank Mega Glassomizer. Gurgling noise or leaks: This is a sign that liquid has found its way into the metal tube in the center of the Kanger Aerotank Mega Glassomizer (and usually occurs after a refill). Ridding the center tube of liquid will resolve the issue. To do so without emptying the tank, remove the Clearomizer from the battery, wrap a cloth or tissue around the battery end of the Clearomizer and blow through the mouthpiece. The atomizer head of the Kanger Aerotank Mega Glassomizer can unfasten when unscrewing the tube or base. Always secure the atomizer head before reinstalling the base of the Kanger Aerotank Mega Glassomizer. It is normal to find a small amount of liquid in the battery contact area when removing the Kanger Aerotank Mega Glassomizer or any atomizer. We recommend cleaning the battery before charging it.